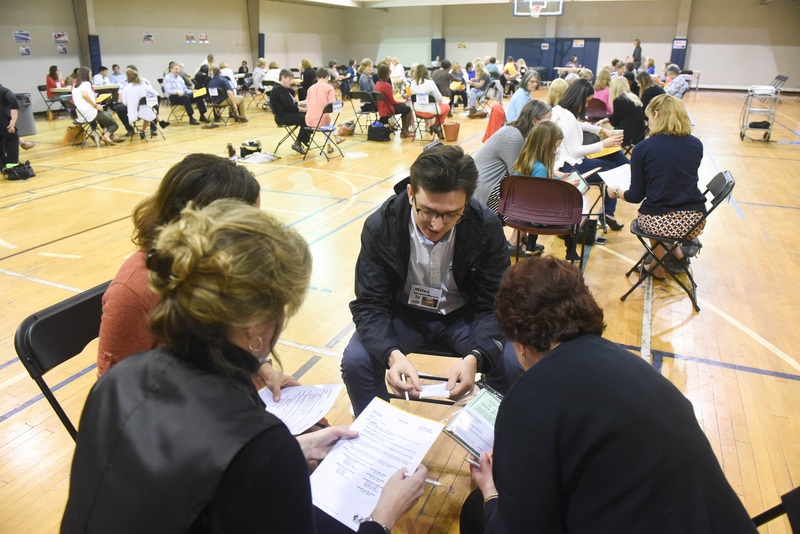 Belmont's College of Health Sciences and Nursing is hosting a Poverty Simulation on campus in the Exercise Science building at Belmont University in Nashville, Tennessee, April 25, 2018. Running around a crowded gym carrying paper money and wearing a nametag detailing the role they were given, nearly 100 Belmont College of Health Sciences and Nursing (CHSN) faculty and staff filled the Sports Science Center on Wednesday, April 25 to participate in the Community Action Poverty Simulation (CAPS). Booths representing community agencies (social services, school, the bank, a pawn shop and more) lined the walls as participants assumed their roles. Some were experiencing homeless, others represented single parents and even more participated as families with many children — all simulating exactly what it is to live in poverty across America. CHSN hosted the simulation as part of the BeTIP program–Belmont’s Educating Trauma-Informed Professionals Initiative, a program that is funded by Belmont’s receipt of an Adverse Childhood Experiences (ACEs) grant administered through the Department of Children’s Services Building Strong Brains Tennessee Initiative. Director of Clinical Education in the School of Physical Therapy Gail Bursch participated in the simulation and was given the role of a single mother of two–a 17-year-old son who had dropped out of high school, was selling drugs and had a pregnant girlfriend and a 15-year-old daughter in high school. Her husband had recently left and the family was forced to survive on only $20. Bursch said the experience was incredibly eye-opening and induced significant amounts of stress on she and her family. That’s why Taylor and her team are actively working to ensure their students and graduates are familiar with the effects of poverty throughout our communities. Experiences like the Poverty Simulation provide significant perspective that assists in informing their practice. The College plans to host the simulation again in the fall for students.